The dramatic terrain of Sikkim guarantees stunning vistas of snow-capped Himalayan peaks and challenging biking on roads lined with a wide variety of rhododendrons. This landlocked northern Indian state is bordered by Nepal, Tibet and Bhutan, and the influence is seen in the people, the majority of whom are ethnically Nepali, and the two predominant religions of Hinduism and Vajrayana Buddhism. We start our tour at the state capital of Gangtok, which is also a centre of Tibetan Buddhist culture and learning. On our first day of riding we'll take an easy cycle to get used to the higher altitude of 1,437 m (4,715 ft) and use our bicycles to visit the 200-year-old baroque Enchey monastery. The next day we'll continue our exploration of Tibetan Buddhism when we ride to Rumtek Monastery, the largest in Sikkim. Now our daily ascents and descents begin in earnest! We'll be riding down into valleys and then up over passes (none higher than 2,100 m) where we'll have the the Kanchenjunga mountain range as our backdrop. There are five peaks in the range, and include Kanchenjunga, the third highest mountain in the world, with an elevation of 8,586 m (28,169 ft). We take breaks to visit Tibetan Buddhist monasteries, make a wish at Sikkim's holiest lake, sample tea from local plantations, and ride a toy train in the colonial hill station of Darjeeling. The lush green landscape punctuated with colourful rhododendrons and orchids is breathtakingly beautiful, the ancient monasteries and Tibetan Buddhist culture is enriching and the tea is superior, welcome to Sikkim. 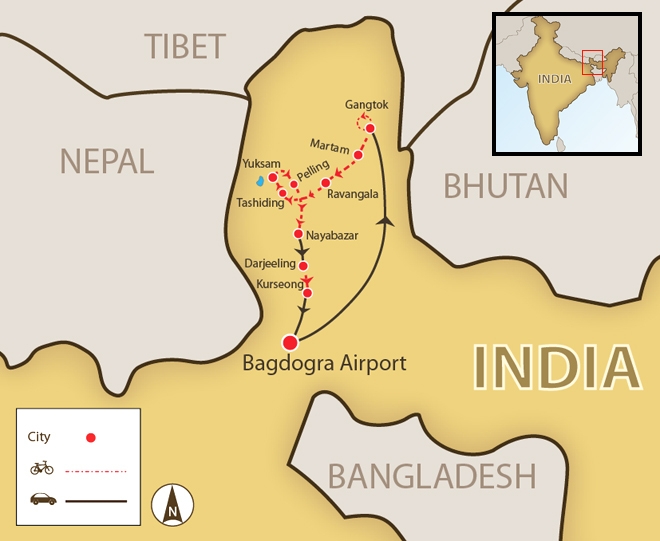 Meet at the airport to transfer to Gangtok for hotel check-in, dinner, and briefing. We take a short ride around Gangtok, visiting the orchid sanctuary and bike to Enchey Monastery. If time permits, there is also the Institute of Tibetology to visit. We cycle down to Rumtek Monastery, which dates back to the 16th century, and is currently the largest in Sikkim. We start with a marvellous downhill to Sirwani Bridge. Then we climb to Temi Tea Garden, with tea known for its taste and fragrant aroma. We climb up to Damthang then have a gradual downhill and uphill to picturesque Ravangala. This small town is located on a ridge and is often windy in the afternoons and cold in autumn. We freewheel down more than 1,500 m to Legship then cycle uphill to Ta-shiding, taking a break to visit a monastery and finish at Yuksam. Another up and down day as we ride through forests past Kanchenjunga Waterfall, villages, and rhododendrons to Pelling, where our hotel over-looks a steep valley. The best cycling day with mainly downhills on good tarmac roads. The descent isn't steep, so you can look around and enjoy the breath-taking landscape and stop and take photos. Explore Darjeeling! Take a ride on the toy train, visit the Himalayan Mountaineering Institute, go shopping for tea, or visit the Tibetan Self Help Centre. We cycle from our hotel through an old residential area of Darjeeling, then cross the old Hill Cart Road and then take the Old Military Road. We meet up for our farewell dinner and celebrate all the hills we conquered. Transfer to Bagdogra airport for early afternoon flights. Day 2 - Gangtok Ride 20km. +649m / -646m. This trip allowed us to experience local culture and meet people, led by the excellent guide Thinles, whose knowledge and enthusiasm energized us. On a bicycle we were able to cover a lot of distance and still be able to stop at a local market or witness local people in their daily activities. People were friendly and liked to talk with us. The compassion of Buddhism permeates the area. This was a hard ride with altitude and steep mountains, so few people will be able experience it, making it a rare adventure. Thinles gave us the opportunity to ride in the van when the difficulty was too much. The Sikkim tour allowed us to experience a majestic and unspoilt area with warm friendly people, but nothing was flat. Our Guide Thinles was fabulous! He is real pro. He embodies what a guide should be. He was knowledgeable, a great communicator, and a thoughtful warm person. Also the driver Keran was exceptional. The two, along with a beautiful country made for a wonderful experience. This trip through the tea and spice plantations of Kerala was exhilarating, challenging and full of wonderful sights, tastes and experiences. Both our cycle guide and our driver were very helpful and conscientious, making sure we were well briefed and taken care of. We cycle 330 km in seven days of cycling. There will be many glorious downhills, but also many ascents. They will be easy grades, but they will be long. We’ll stay in mountain resorts – all are comfortable lodgings, and some will have a distinct colonial feel to them. Suitability: The many climbs we’ll be doing means that this trip will be more enjoyable if you have a good level of stamina and fitness. We will spend a day acclimating in Gangtok before we start riding up to higher passes. Biking Conditions: The road surfaces are almost all paved, but in high altitude conditions of extreme weather, there will be patches where the road has disintegrated and will be potholed or even gravel. The Indian army engineers are constantly working on these roads, so most of them are in good condition. They are also built with gentle gradients, with most up-hills having a 7% grade; however, there will be a few exceptions up to the top of passes. There is no technical riding involved on this tour, with all the challenge coming from cycling at 2,000 m altitudes and the many ascents. Because this trip is fully supported, weary cyclists can take breaks in the support vehicle if required. Arrive at Bagdogra Airport in time for a 2 pm departure to Gangtok. This is a 4 ½ hour drive. Once we reach our hotel, we'll freshen up and then meet for dinner and a trip briefing. We hop on our bikes for a short ride around Gangtok. During this warm-up ride, we can make any adjustments needed to our bikes before we truly hit the road. We visit the orchid sanctuary and bike to Enchey Monastery. Its sacredness is attributed to the belief that protecting deities reside inside and that these powerful deities always fulfil the wishes of devotees. If time permits, there is also the Institute of Tibetology to visit. We leave our hilltop heights and cycle to Martam (1,363 m) passing through Ranka Village. We stop to visit Rumtek Monastery, which dates back to the 16th century. In 1959, the 16th Karmapa fled Tibet and took over Rumtek as his main seat in exile. The monastery is currently the largest in Sikkim. We start with a marvellous 24 km / 1,0000 m descent to Sirwani Bridge that crosses the Teesta River. Then it's an uphill climb to Temi Tea Garden; the tea estate covers 435 acres. Temi produces the finest quality of tea that is famous for its taste and fragrant aroma. Our overnight is at a hotel that has delightful views overlooking the tea gardens. Our ride will be undulating, with an uphill to Damthang (2,051m), then a gradual downhill, and then uphill again to picturesque Ravangala (2,040 m). Mt. Kanchenjunga and Mt. Kabru are just a few of the major peaks clearly visible from Ravangla. This small town is situated on a ridge and is often windy in the afternoons and cold in autumn. Later, we visit Buddha Peace Park and see amazing sculptures and paintings at one of the region’s most sacred monasteries. We depart Ravangala, freewheeling downhill for 20 km and cycling uphill to Tashiding, taking a break to visit a monastery. Built in 1716, the monastery is known for its annual 'Bumchu' festival, where a barrel filled with holy water is opened and the water level indicates the kind of year that will follow. We then continue to Yuksam (1,780 m) and our hotel with panoramic views of the Kanchenjunga mountain range. Another up and down day awaits as we depart Yuksom through forests and cardamom groves past Kanchenjunga Waterfall and villages. Enjoy the gradual undulating slopes and the view as you ride. We then pedal uphill and zigzag our way into Pelling, a town known for its magnificent views of Kanchenjunga and surrounding mountain ranges. Our hotel overlooks the valley. The best cycling day yet, as most of today's ride is downhill on good tarmac roads. The descent isn't steep, so look around and enjoy the breath-taking landscape and stop and take photos. When we have finished our freewheeling, we pack up the bikes and drive approximately 4 hours up a steep incline to the hill station of Darjeeling. 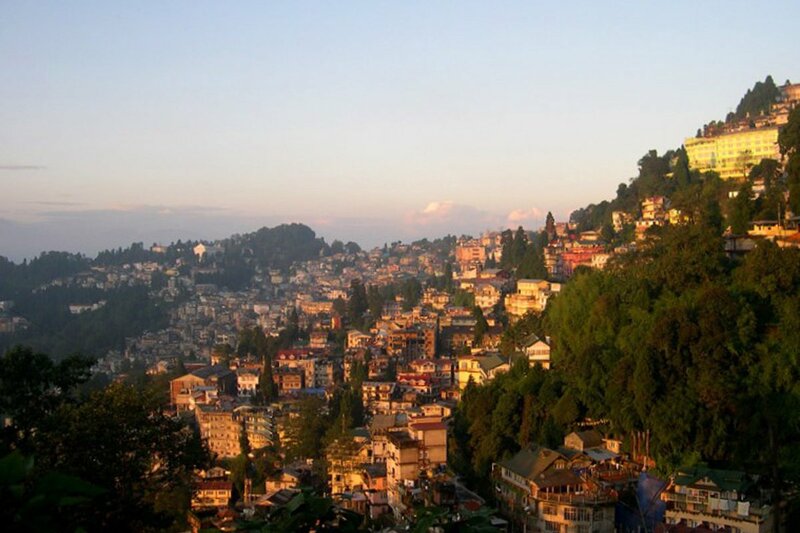 Annexed by the British in 1849, Darjeeling became part of British India and was the de-facto summer capital of India during the days when the Raj was governed from Calcutta. More recently, it has seen an influx of Tibetan refugees who mix with the many Nepali and Bihari residents. Today you are free to explore Darjeeling! There’s the toy train you can ride. It’s a narrow-gauge railway built between 1879 and 1881 and is still powered by a steam engine. Or visit the Himalayan Mountaineering Institute, a premier training centre for mountaineers as well as a museum detailing the Mt. Everest ascent by Sherpa Tenzing and Sir Edmund Hillary and numerous other expeditions. Or go shopping for tea, or visit the Tibetan Self Help Centre, where young people train in the intricate art of Tibetan handicrafts and handlooms. Dinner is on your own; you can choose between North Indian, Nepali, or Tibetan cuisine. Back on the bikes, we cycle from our hotel through an old residential area of Darjeeling called Toong Soong, past the stables, and then continue past Alubari with views across the valley towards Kalimpong. If the weather cooperates, we'll have great views of the mountains. After reaching Jorebungalow, we cross the old Hill Cart Road and take the Old Military Road (also known as Old Calcutta Road as the British travelled on this road from Calcutta). We pass Chimney Village, named after the remains of an old British bungalow. We arrive at our hotel in time for you to enjoy the tea bar. We meet up for our farewell dinner and celebrate all the hills we conquered. We transfer to the airport to catch early afternoon flights.